If you are looking to buy property in Fuengirola, Costa del Sol, Spain then you will almost certainly need to find a list of Fuengirola real estate agents. Our list of estate agents also helps if you are looking to find properties for sale or rent, or if you are wanting to sell your own property. Estate agents located in Fuengirola will also be able to help you find property in towns, villages, urbanisations and developments close to the Fuengirola area. These include: Parque del Sol, Castillo Sohail, Las Lagunas, Parque Villalobus, Urbanisation Jardines del Aguila, Cerrado del Aguila golf, Santana golf and country club, La Cala golf, Mijas golf, Naranjas golf, La Cala resort, Puebla Aida, Las Acacias, Campo Mijas, Las Yucas, San Francisco, Colina Blanca, Los Olivos, Las Lagunas, Don Alberto, Playa de la Campana, Punta de Calaburra, Calaburra, Residencial Hipodromo, Santa Fe de los Boliches, Torreblanca and Torremar. Estate agents in Fuengirola operate differently as opposed to countries such as the United Kingdom. In the United Kingdom you have to trawl from one estate agent to the next and each has their own unique properties for sale. This is very time consuming. Fuengirola estate agents and inmobiliaria have their own unique properties for sale but they can also show you other properties on sale from other Fuengirola estate agents. If you want to buy a property in Fuengirola – the two estate agents will split the commission so the property you want to buy won’t cost you anything more. If you want to know all about what it is like living in Fuengirola and the current property market, then you must read our in-depth interview with Daniel Holmquist of Alamo Costa del Sol Real Estate on our main Fuengirola page. Daniel, what would you say would be the advantages to living in Fuengirola compared to other Costa del Sol towns? Fuengirola, with its near 70,000 inhabitants is the centre of many of the Expat communities on the Costa del Sol. The train from Malaga, by way of the airport, has its last stop here. There are many reasons why so many of our clients prefer Fuengirola. You don’t need a car, several international schools, churches, associations are located in Fuengirola. Many of the businesses in the area are owned by foreigners and the majority of shops have English speaking staff. However, apart from the expat communities, Fuengirola is a Spanish town with a pulsating everyday life that keeps the city moving also in the winter. The town is located only 20 minutes’ drive from Malaga airport and it has the longest and most beautiful beach promenade on the coast. 8 kms with generous cycle and pedestrian lanes are lined with hundreds of restaurants and bars. Just outside Fuengirola is Mijas Golf with two 18-hole golf courses. Property prices have slowly started rising again, after hitting rock bottom less than a year ago. 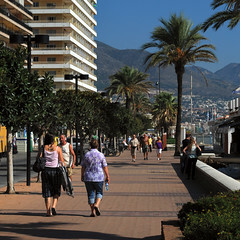 Avenida Acapulco 7, Los Boliches, Near Fuengirola, Spain. Mi Casa Spain Los Boliches S.L. Remember to go on your instincts. Buy what YOU want to buy. Of course you should listen to advice from the Fuengirola estate agent, they know the local area and know the Fuengirola property market inside out but ultimately it is your decision on whether to buy a property. Don’t be swayed by an agent who is looking to influence you unduly in order to make the sale. Estate agents in Fuengirola will view a property and give a guideline at which price to market the property however ultimately the owners decide at which price to sell the property for and some unrealistically overprice their houses. Estate agents in Fuengirola charge different commissions, expect typically to pay between 3% and 5%. If you are looking to sell your property in Fuengirola then we recommend going for an estate agent with an office in a busy location. Many estate agents in Fuengirola will also have houses and apartments for rent in Fuengirola. Do consider a long term let or rental in Fuengirola or rent a villa or apartment in Fuengirola as a way to get to know the area first. Most Fuengirola estate agents should also be able to help you with these services: finding apartments for sale or rent, villas and houses for sale or rent, townhouses for sale or rent, selling your property, letting your property, information on the local area such as amenities, facilities and schools, new build properties and resales, cheap bargain properties including repossessions and distressed sales, property maintenance, valuations, luxury properties, property finding services and arranging mortgage financing, Some agents will also handle commercial property such as shops to let or lease, bars and restaurants for sale and land for sale. Below is a simply stunning must-see video of Fuengirola from the air! Estate Agents in Fuengirola – Page Summary – This page contains unique content about estate agents (known in Spain as inmobiliaria) in Fuengirola as well as a directory of known estate agents in order to help people looking to let or buy property in the Fuengirola area. good morning i am looking to rent apt for two weeks with my husband and son ,my sister has apt on acupulco av los boliches i wonder would you have anything on this exact road ,we r looking at the 19 june to the 3 of july .many thanks . Can anyone please recommend a letting agent in the Fuengirola area?